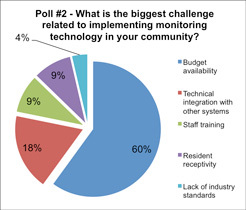 In a recent online poll1, senior living executives, administrators, and program directors cited that budget availability is the biggest challenge they face related to the implementation of monitoring technology. Download our ROI case study and see how implementing technology may be more affordable than you think. 1 Transforming Eldercare with Smart Sensor Technology webinar, January 24, 2013. View webinar.